The Southwestern Ontario Orthophotography Project (SWOOP) image data consists of Fugro acquired digital imagery with sensor Leica geosystems ADS100 collected between April 12th and May 23rd 2015. SWOOP 2015 Algonquin encompasses the region of Algonquin Provincial Park. Imagery acquisition was performed at 2,377 m AMT (above mean terrain) to produce a 20cm GSD RGBNiR orthorectified imagery. The orthophotography provides high-resolution, true colour aerial coverage for Southwestern Ontario. This data serves as a valuable information resource, providing a spatial context to features existing on the landscape in 2015. 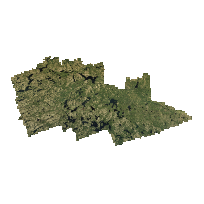 The digital orthophoto imagery tiles are provided in Jpeg 2000 format, and are of a lossless compression. The aerial imagery, from which the orthophotography was derived, was collected between April 12th and May 23rd 2015. Additional coverage of the following municipal tiers is available in the geoportal as a separate data set for use: Bruce County, Brant County, Elgin County, Essex County, Grey County, Haldimand County, Huron County, Lambton County, Middlesex County, Norfolk County, Oxford County, Perth County and Wellington County, Dufferin County (west), and the Municipality of Chatham-Kent. GPS phase data was post processed with continuous kinematic survey techniques using “ On the Fly” (OTF) integer ambiguity resolution. The GPS data was processed with forward and reverse processing algorithms. The results from each process, using the data collected at the airport, were combined to yield a single fixed integer phase differential solution of the aircraft trajectory. The differences between the forward to reverse solution within the project area were within project specifications (<10cm) in both the horizontal and vertical components, indicating a valid and accurate solution. An IMU was used to record precise changes in position and orientation of the ADS100 Digital Camera System. All IMU data was processed post flight with a filter to integrate inertial measurements and precise phase differential GPS positions. The resulting solution contains geodetic position, omega, phi, kappa, and time for digital image processing. Tiling is based on 1,000m x 1,000m tiles. All SWOOP 2015 deliverables are in UTM Z17. 2.4.3 Accuracy 2.4.3.1 The image Deliverables (orthorectified imagery, stereo models) must have a horizontal accuracy of ± 0.5 metre or better, based on CMAS statistics, with a confidence level of 90%. 2.4.3.2 Elevation products (DEM, stereo models, masspoints and breaklines etc.) must have a horizontal and vertical accuracy of sufficient quality to meet or exceed the requirements to obtain the accuracy, set out in section 2.4.3.1 for the orthorectification of the imagery Deliverables. 2.4.3.3 Ground control points that are used to georeference the imagery must be collected with an accuracy level suitable to obtain the required accuracy for the orthorectified image products, as stated in 2.4.3.1. 2.4.3.4 Any Deliverable found to be outside the required accuracy set out in section 2.4.3.1 will be rejected and will result in more extensive testing and review by the Ministry. Any corrections or recollection of ground control points will be completed by the Supplier, at its own expense. The source data vertical accuracy supports horizontal accuracy requirements. The Leica GeoSystems XPro software was used for downloading and preparing imagery collected with the ADS100 Airborne Digital Sensor for softcopy photogrammetric use. The raw image was downloaded in the field with XPro to a portable workstation. This enabled a quick look at image quality and coverage. Using the Leica Geosystems IPAS software package the GPS data was differentially processed against a base station. After the differential GPS solution was checked and verified the Leica Geosystems IPAS program was used to compute an integrated GPS/IMU navigation solution at one-second intervals. Using the GPS/IMU trajectory computed by the Leica Geosystems IPAS software and the camera calibration, XPro computed a full x,y,z, omega, phi, kappa exterior orientation of each scan line. Using the orientation data file produced the L0 imagery was resampled. The resampling removes most aircraft motion and provides epipolar geometry imagery for stereo viewing, automated aerotriangulation and automated DEM extraction. The Level 1 epipolar- resampled and georeferenced imagery usually will provide a pixel's true ground location to within a few pixels without any additional processing. To improve accuracy, a fully automatic aerotriangulation process was performed to minimize the residual errors in the GPS/IMU derived exterior orientations. The aerotriangulation also allowed the introduction of ground control and checkpoints to ensure the accuracy specifications were achieved. Automated aerotriangulation of ADS100 imagery was performed with the Xpro. A digital elevation model (DEM) was required for orthophoto production. DEM was autocorrelated and used to generate the ortho-rectification imagery. The orthorectified imagery was created utilizing Leica Geosystem XPro software. The orthos were mosaicked together using proprietary image database and mosaicking software. The database was edited for seamlines, and other artifacts. The imagery was clipped out of the database into the sheet layout generated based on client use requirements. In the clipping stage, the coordinate system and georeferencing was embedded into the header of the TIFF file. The stereo and orthorectified imagery was QC'ed and delivered on external hard drives. Digital Push Broom Sensor: GPS phase data was post processed with continuous kinematic survey techniques using On the Fly (OTF) integer ambiguity resolution. The GPS data was processed with forward and reverse processing algorithms. The results from each process, using the data collected at the airport, were combined to yield a single fixed integer phase differential solution of the aircraft trajectory. The differences between the forward to reverse solution within the project area were within project specifications (less than 10cm) in both the horizontal and vertical components, indicating a valid and accurate solution. An IMU was used to record precise changes in position and orientation of the ADS100 Digital Camera System. All IMU data was processed post flight with a filter to integrate inertial measurements and precise phase differential GPS positions. The resulting solution contains geodetic position, omega, phi, kappa, and time for digital image processing.